Bad losses lead to so much hyperbole on the Internet, I would literally light myself on fire before taking part in these arguments. Sean's recap of Sunday's loss at Old Trafford carried the correct amount of apoplexy for the occasion. A title contender shouldn't lose that match, against that opponent, unless there are serious psychological issues at play. We all know that's the case, given the zero points they took from the worst Chelsea team in years. And so, another season goes by without a league win at Old Trafford. I'm not in the recap business, so it's time to look forward. Entering this round of fixtures, Arsenal's chances of winning the title were 6.8%. It was 45.6% for Leicester and 43.3% for Tottenham. Looks bad, right? Well, win tonight, and it's progress. Then, win Saturday at White Hart Lane, and Arsenal are level with their nearest and dearest again. With nine matches to play, they'd be right back in the conversation, especially after Leicester drew West Brom at home last night. I don't call games "must win" very often, but they must win these two games. There's good news on the Alex Oxlade-Chamberlain front; his MRI has revealed that surgery will not be required to repair the ligament damage he suffered against Barcelona, which means his return to training has been slated for "six to eight weeks" instead of "months." What exactly that'll mean for Arsenal's season in April and May depends on how many games Arsenal manages to win between now and then, of course. Elsewhere, there's no change to the injured list, though Arsene Wenger mentioned wanting to be cautious with Danny Welbeck's playing time as he returns from 10 months out. There could be some rotation to get some fresh legs in and/or remove Theo Walcott please please please please. With an unbelievably critical North London derby at the weekend, Wenger might also have some rotation in mind to prepare for that, too. There was some news on Santi Cazorla later in the day yesterday, with word that his comeback has been delayed due to an Achilles problem. Truly bad news, as the past two months have really shown how much this Arsenal team needs his influence in midfield. Predicted XI: Cech, Bellerin, Mertesacker, Koscielny, Monreal, Coquelin, Elneny, Alexis, Welbeck, Ozil, Giroud. Wait, what? Swansea have no injuries? A fully available squad? Nothing for me to write about here? Pfffft. Thanks for nothing, Swansea. Leroy Fer might get his first start for the Swans since joining from QPR on loan at the end of January. There, I said something of note. Predicted XI: Fabianski, Naughton, Fernandez, Williams, Taylor, Cork, Britton, Fer, Sigurdsson, Paloschi, Ayew. There's not much to say about Arsenal's form that wouldn't be countered by "yeah, but they lost at Old Trafford." Since Danny Welbeck's late winner against Leicester City, Arsenal have not won. They drew Hull City, lost to Barcelona, and lost to Manchester United. That's their form. Arsenal haven't played more than 30 seconds of football with the lead since winning at Bournemouth on February 7. The fact that Arsenal are even still slightly in the title race with the 2016 they are having is a miracle. Swansea, meanwhile, are in danger of relegation. They are sitting 16th in the table, with 27 points. They are three points clear of Sunderland, Norwich. and Newcastle behind them, but have a significantly better goal difference than their relegation rivals. Since Boxing Day, Swansea have won two, drawn three, and lost five. They crashed out of the FA Cup at the first hurdle to Oxford United. They did not win a game in the month of February. This is all set-up for a 1-1 draw, isn't it? In the reverse fixture back in October, Arsenal looked shaky for a half but eventually cruised to a 3-0 victory at the Liberty Stadium. The Swans missed a number of chances to draw first blood and the match remained scoreless at halftime. Olivier Giroud broke the deadlock four minutes after the restart. Laurent Koscielny later scored from a Lukasz Fabianski mistake to double the lead, then Joel Campbell scored his first as a Gunner to make the three points safe. Swansea took all six points from Arsenal last season. At the Emirates in May, Bafetimbi Gomis had the winner, against the run of play, in the 85th minute. Arsenal had 68% possession, took 23 shots, and put nine on target, but ex-Gunner Lukasz Fabianski kept the clean sheet for a 1-0 Swansea win. Arsenal had been winless in their last three against Swansea before the win in October. 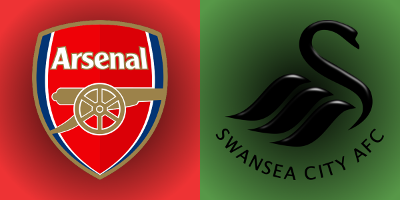 All-time in league play, Arsenal and Swansea each have six wins against each other. Swansea have only lost one of their Premier League trips to the Emirates, their first one in 2011. Since then, they've won twice and drawn once, thanks to a late Mathieu Flamini own goal equalizer. They did lose an FA Cup replay at the Emirates in January of 2013, thanks to a late Jack Wilshere goal. The referee is West Yorkshire-based Robert Madley. Arsenal have seen Madley only once so far this season, for their 3-1 win over Sunderland at the Emirates back in December. Arsenal won both of their matches with Madley last season as well. The 30-year-old Madley has been in the Select Group since 2013; Arsenal have not lost a match with him in charge. Swansea have had Madley three times already this season and the Swans have lost all three: 1-0 to Watford in September, even though Watford had Valon Behrami sent off on 64 minutes, 1-0 to Stoke City in October, and 2-1 to Manchester City in December, when Bafetimbi Gomis's late equalizer was matched by an even later winner from Kelechi Iheanacho. Swansea's last win with Madley in charge came last March, 1-0 over Aston Villa. Madley was promoted to the FIFA referee list back in January. John Painting is a contributing writer to the Modern Gooner and is running out of ideas for this section. You can follow him on Twitter @zorrocat to give him some motivation to be more clever.